Famous for its fantastic white sand beaches and brilliant turquoise bays, Barbados conjures up images of a tropical island paradise. The interior of the island is dotted with colourful gardens and lush forests, while the coastline is home to an array of laid-back beach bars, waterfront restaurants and some of the world’s finest hotels. Barbados luxury holidays are all about barefoot relaxation and unique experiences. At Azure, our tailor-made packages can be designed to suit your individual needs, whether you’re looking for a family-friendly getaway or a romantic couples retreat. 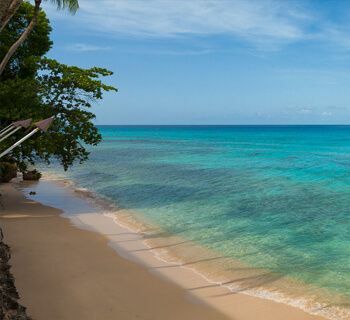 Barbados is brimming with beautiful landscapes, from picturesque beaches to rugged peaks. 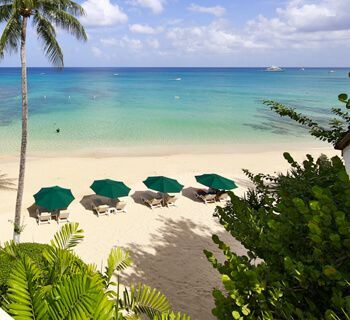 If you want to live in the lap of luxury and make the most of the natural scenery, 5 star Barbados hotels are located along the coastlines and surrounded by tropical gardens, boasting some of the island’s best views. 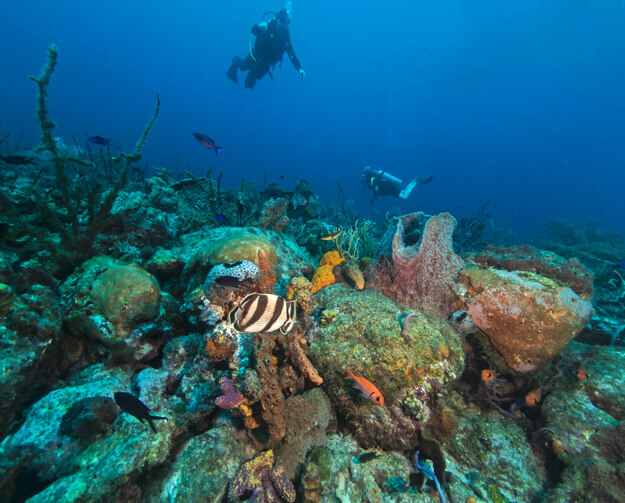 For an underwater adventure, head beneath the waves and snorkel or dive among colourful tropical fish and coral. Harrison’s Cave is the place for an eco-adventure, where you can squeeze through narrow passages illuminated by the glow of your head torch. Don’t miss the chance to visit Magnetic Hill either, where cars appear to defy gravity by freewheeling upwards. When it comes to eating out, Barbados has everything from fine dining to street food. Unsurprisingly, seafood is a local speciality and is heavily featured on restaurant menus. Ostins is a fishing village on the south coast of Barbados and is famous for its fresh fish dishes and party atmosphere on a Friday night. Barbados is the home of the oldest commercial rum distiller, and those who enjoy a tipple or two will relish the chance to try the locally brewed Mount Gay Rum, which is regarded by the locals as golden nectar. The island also hosts many food and drink festivals throughout the year, where visitors are invited to taste many wines and rums and try local food from pop-up stalls. If you want to immerse yourself in Barbados culture, take the time to visit some of the island’s historic buildings. Parliament Building in Bridgetown is a neo gothic-style building constructed in 1871 and houses the Senate and House of Assembly as a reminder of the nation’s proud democratic heritage. Also worth a visit is the Nidhe Israel Museum, located on a restored 1750 Jewish community centre, which documents the story of the Barbados Jewish community. Don’t miss the chance to see a Tuk band performance, which features a bass drum, kettle drum and pennywhistle. Tuk bands are usually accompanied by costumed figures such as ‘Shaggy Bear’, ‘Green Monkey’ and ‘Mother Sally’. Landships also perform traditional parades and dances to Tuk bands, depicting the passage of ships through the Barbados seas. Those who love to shop should head to the island’s many markets and craft stalls and browse the selection of handmade pottery on offer. The finest hotels still carefully maintain their classic island style, knowing it is this that keeps people coming back for more. Most of them also continue to be low-rise with the best ones situated along the island’s fabled west coast; handy not only for the championship golf, but also for the gourmet eateries that now proliferate. If you’re looking for a relaxing escape to soothe the mind and body, Waves Hotel & Spa by Elegant Hotels is the perfect choice. Pure indulgence is guaranteed as you soak up the resort’s tranquil atmosphere and exceptional personal service. With inspiring ocean views, lush scenery and a dazzling white beach, you’ll never want to leave this tropical paradise. Offering a peaceful sanctuary set against a striking seascape, Treasure Beach by Elegant Hotels is the ultimate romantic retreat. A boutique, adults-only hotel, it offers guests every imaginable luxury for an unforgettable island getaway. 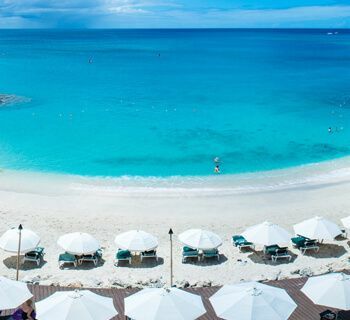 Nestled on a stunning white beach with glorious ocean views, Treasure Beach is a truly special place you’ll want to return to again and again. 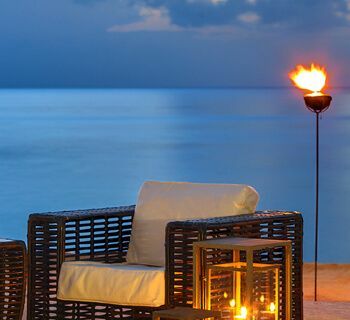 One of the most exclusive hotels in the West Indies, the Sandpiper is a joy to behold. The proprietors, Wayne and Karen Capaldi, provide pampered privacy where top-class service is combined with the warmest Caribbean hospitality. 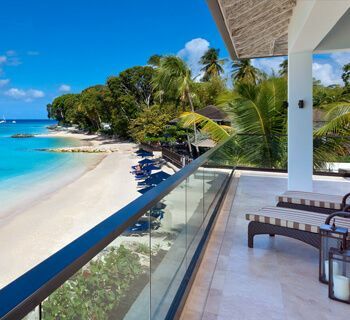 The House by Elegant Hotels is an adults-only resort found at the fabulous Payne’s Bay on Barbados’ legendary Platinum Coast. The superior suites, attention to detail and courteous service resulted in The House being named as one of Travel & Leisure’s Top 25 Resort Hotels in the Caribbean in 2017, and if you decide to visit, you’ll soon understand why. 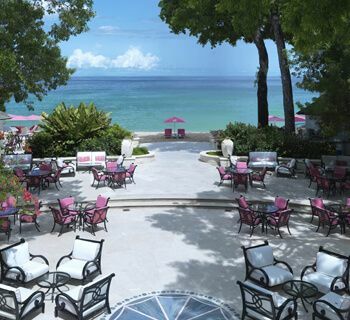 Just a 45-minute journey from Barbados Airport, the Fairmont Royal Pavilion is the only luxury hotel on the Platinum Coast located directly on the beach. The Fairmont Royal Pavilion is the perfect place to stay if you seek top-class service, delicious food and blissful surroundings. 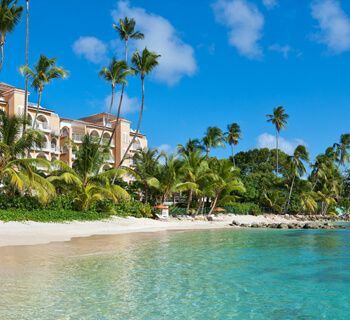 Saint Peter’s Bay Luxury Resort & Residences can be found nestled on the sun-kissed coast of Barbados. The resort offers spacious beachfront villas, excellent amenities and a long sandy beach, making it a real Barbadian treasure.